In case you missed it, Archaia Entertainment have collected several of their comic book titles based on the work of Muppets creator Jim Henson into a series of hardcover full-color graphic novels. First up is Jim Hensons Dark Crystal, Creation Myths. From the pre-release publicity, this is “an original graphic novel hardcover set one thousand years before the crystal cracked, before the world of Thra fell to strife and destruction. 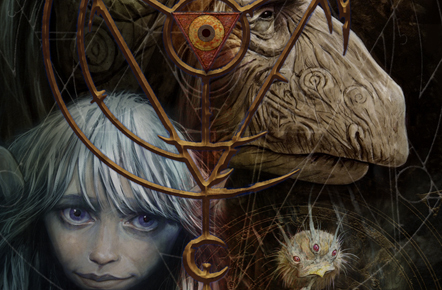 Original Dark Crystal movie concept designer Brian Froud will plot, provide the cover, design characters, and art direct.” The stories are by Brian Holguin, and the interior art is by Alex Sheikman and Lizzy John. Archaia have also collected Jim Henson’s The Storyteller in a hardcover volume, with stories written by Katie Cook and illustrations by a bevy of well-known artists. Up next is an original graphic novel based on Jim Henson’s film Labyrinth, which Archaia editor-in-chief Stephen Christy speaks about on their web site.